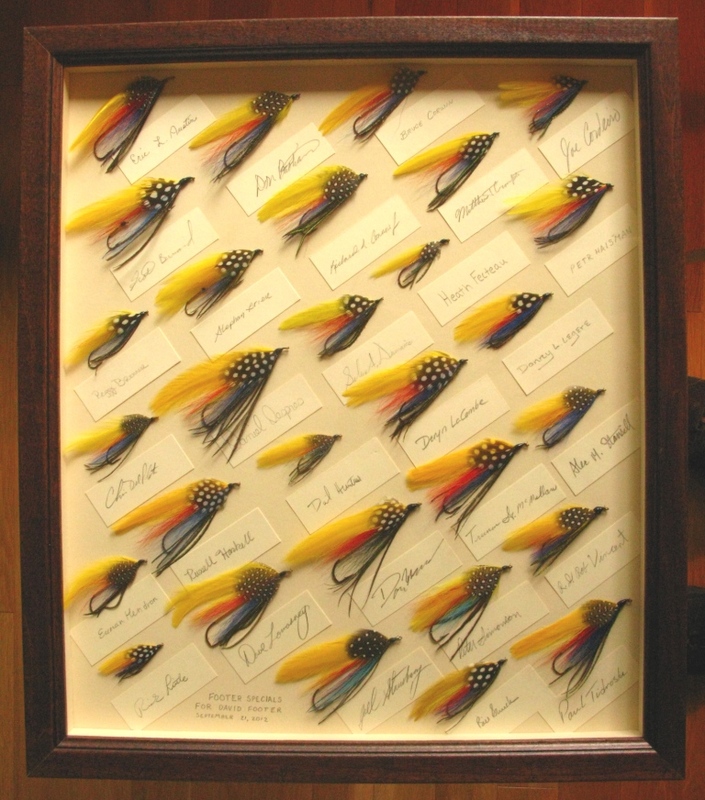 This entry was posted in Fish Stories and Other Tales, Schedule and Events, Streamers and Bucktails and tagged David Footer, Footer Special. The frame was presented to David Footer, artist, taxidermist, carver, a Maine icon now. He’s been a taxidermist for over 60 years. He mentored under Herb Welch of Haines Landing (Oquossoc, Maine). Welch was recognized as one of the greatest taxidermists of his day. David Footer created the Footer Special in 1962, though like Maine Warden Joseph Stickney (Supervisor, Warden’s Worry, Lady Doctor), David was not a fly tier. Footer painted the fly and then had a friend dress it for him. Thanks so much for your comment! Nice to hear from you again! hope all’s well and happy fall fishing ! Thank you for your comment, and glad you enjoyed the info. David Footer is quite a talented and interesting man. Thanks again! Thanks for the opportunity and for including my fly. I’m honored to have participated. Thank you Bruce, it was an honor to have your participation in the project. See you at Danbury…Thanks for your comment! Wow. Simply beautiful! What a frame. Thank you very much for you compliment on this frame! Thank you for your comment! That all sounds great! Thanks for your appreciation of my work and comment!